Aloha! The HTA Middle School team propels students in a trajectory of academic excellence by fostering a love of learning and collaboration. Our highly qualified teachers are dedicated to delivering rigorous content through HTA’s unique blended learning model. To the HTA Middle School team, blended learning involves meaningful face-to-face and virtual classes with teachers, in addition to guided practice with Learning Coaches. As a public charter school, HTA teaches Common Core State Standards. These standards are designed to prepare students for college and career readiness. Common Core is not the curriculum, but is the collection of standards that define what each student should understand or be able to do at each grade level. The instructional learning platform for students in grades 6-8 is called Connexus. Teachers create their own authentic lessons, activities and assessments to supplement the online curriculum. Instruction at HTA is delivered in a variety of formats, including face-to-face, virtual, and online instruction. Face-to-face instruction at HTA includes: whole group instruction, small group instruction, collaborative activities, labs, and much more. The same modes of instruction can be applied in the virtual instruction setting. Teachers use Adobe Connect as a platform for delivering virtual instruction. Online instruction at HTA includes Connexus lessons, teacher-created lessons, and teacher-selected online curriculum. Students also take part in independent learning, through the guidance of a parent Learning Coach and support from a certified teacher. 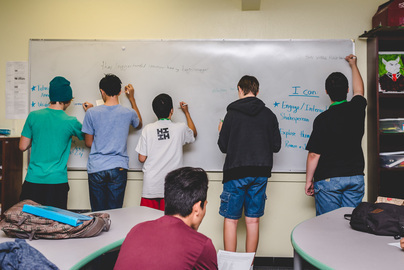 Middle school students at HTA take courses in the four core content areas of mathematics, English language arts, science, and social studies. Middle school students at HTA have the opportunity to take part in field trips with their classmates. These field trips provide hands-on learning experiences and social interaction. The middle school organizes events throughout the year. The middle school students have enjoyed a back-to-school mixer, beach bash, camping trips, and more. A variety of clubs are offered at HTA, outside of daily instructional time. HTA is proud to have a competitive math team and a nationally competitive robotics team. Please visit our Locations page to find an HTA campus near you.